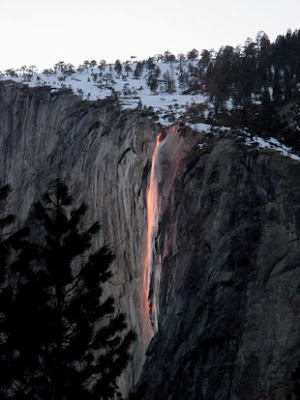 Wonders in Yosemite National Park, California, it appears at sunset and only inmid-February. 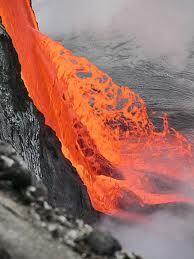 Photographers and visitors to the park was waiting the appearance of this natural phenomenon. 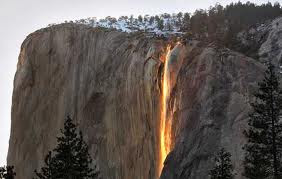 The appearance of this effect depends on the weather, the straight line betweenthe sun and the earth will make Horsetail waterfalls in Yosemite Park into a bright orange, like a fire. The color is the result of reflection of sunlight on the granite rock beneath the water spill. If the sunset when the sky is overcast, then the effect will not be displayed. Horsetail waterfalls are located in the El Capitan rock formations spanningapproximately 1.09 miles above the Yosemite valley. 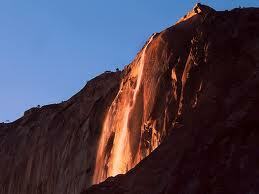 Michael Frye, author of The Photographer's Guide to Yosemite, said, "Horsetail is located in a very unique place. I do not know the other falls on earth as it getslight." "How many waterfalls are located on high cliffs and open? Most are located in thedome or the canyon and will not get sun. Yosemite unique geography makes this waterfall is different," he said. "If you have a good time, so the color is golden, red and orange are wonderful." The best place to look is the eastern peak, near the El Capitan picnic area.